Earthquaker tweaks its nifty chorus pedal, but does it sink or swim? Lots of knobs and lots of control equals lots of cool sounds - you just need to find them! Takes a little to get the best out of. Where many chorus pedals just give you control over the rate and depth of the effect (which may be as much as you need for that classic Boss CE-style chorus, ubiquitous in the 1980s), there are other aspects to the way that chorus is created that are ripe for some knob-driven control. 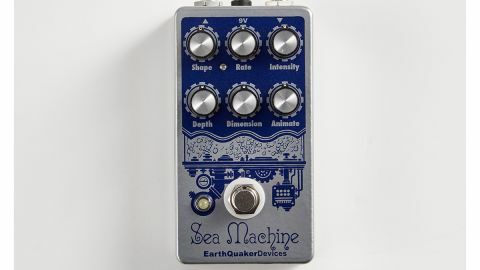 EarthQuaker was determined to offer those options with the Sea Machine V2 and has equipped it with six closely spaced knobs to allow plenty of tweaking. The basic architecture of a chorus pedal is a delay line that is modulated by an LFO, and the bottom three knobs here (Depth, Dimension, Animate) relate to the digital delay line at the Sea Machine's heart, while the top three (Shape, Rate, Intensity) concern the actions of the analogue LFO. The juxtapositions available with all six knobs deliver a wide range of effects that could broadly be described as chorus, but go further than many units. Depth is the first port of call to set the subtlety or strength of the overall effect - it adjusts the mix of the modulated wet signal against your dry guitar signal. Looking at the delay line first without any modulation (Intensity at zero), the Animation knob offers control over the delay time: at low levels you get the really short delays needed for classic chorus, but turned up, there's a doubling effect and at full, it's almost a slapback. Dimension is said to adjust spatial generation. Effectively, it's a feedback knob for the delay, so with Animation and Dimension working together, you have access to a range of ambiences - metallic reverb being the predominant flavour. When it's time to add some modulation, the Rate knob (with associated LED flashing in time) is what you'd expect on any chorus pedal, as is the Intensity knob, which adjusts the modulation depth. More variation is provided by the Shape knob, which changes the wave shape of the LFO between a soft triangle and a square wave for on/off action that's harder-edged. With six knobs to get into position relative to each other, it may take a bit of work to find the sweet spots, but it's worth the extra effort because there are plenty of them to be found, from a slight otherworldly shift in the sound, through lush rotary speaker styles to full-on pitch-wavering warbles.